Wang Xijing is a Chinese artist, a representative of the artistic styles of Shaanxi, and he is best known for his unique style and profound meaning of his drawings of contemporary and historical figures. He was born into a worker’s family in Xi’an in, Wang showed interest from an early age in paper cutting and copying pictures from cartoon books. Later, he bought Jiezhiyuan Picture Copybook, the most popular, elementary, copybook for traditional Chinese painting students, from a second-hand book store, and began to teach himself traditional Chinese painting. In 1959, Wang went to the solo exhibition of established artist Yu Zhengchang to make copies of his work. The older artist immediately saw Wang’s talent and diligence and decided to adopt him as his student. He tutored Xijing in the theory and practice of traditional Chinese painting and set him on the path to mastering the whole gamut of Chinese arts including literature, poetry, philosophy, history and calligraphy. In 1962, with his natural talent for painting, Wang was admitted into the middle school affiliated to Xi’an Fine Art College. In 1968, Wang was appointed as Fine Art Editor at Xi’an Evening Paper. Soon, many readers were struck by the quality of the illustrations in the newspaper. Some even began to buy the newspaper every day, in order to collect and save Wang’s illustrations. The work as Fine Art Editor broadened Wang’s horizons. Within a few years, he had created 24 books of cartoons. Two of them gained national acclaim, making him famous throughout the country. In 1978, Wang published his first academic work The Techniques of Figure Painting through Chinese Line Drawing, which drew on his extensive experience to date. By 1985, he had produced a large number of influential works. Notably, one of these, Six Martyrs of the Wuxu Reform Movement won national acclaim, establishing his place within the ranks of Chinese artists. Full of vigor and raw emotion, the paintings of Wang Xijing are representative of the artistic styles of Shaanxi. 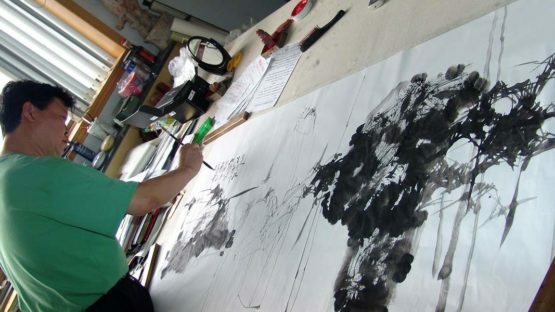 In the 1980s Wang established the Xi’an Academy of Traditional Chinese Painting, and gave solo figure painting exhibitions in Malaysia, Singapore, the U.K, Japan, Thailand and South Korea, as well as the regions of Hong Kong and Taiwan, thereby raising awareness of traditional Chinese painting abroad. He has been invited to hold solo figure painting exhibitions and to give lectures in many major cities in China and more than 30 countries across the world. He has won 16 major national or international awards, and has published a dozen figure painting albums. He is a visiting professor to art colleges in Singapore, Malaysia, Thailand and Japan, as well as a visiting professor to Yunnan University, Northwest University and Xi’an Fine Arts College, and a professor at China Academy of Art Research. Wang Xijing is a productive writer as well, he has published over 5000 articles in domestic and foreign newspapers and magazines, as well as more than 60 books, treatises, and video tapes. He lives and works in Xian, China.